We describe our items well and provide photos, therefore we issue refunds for shipping damage only. Buyer must notify us by email within 24 hours of receiving a damaged item and return the damaged item within 10 days to receive a refund. 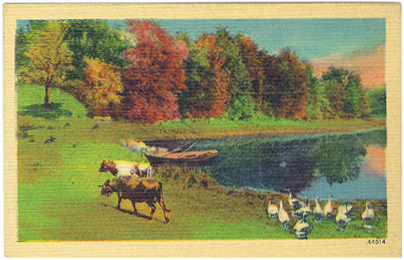 Vintage Linen Postcard of Cows, Geese, Rowboat, Lakeside scene Postcard in very good condition. Never sent or written on. Ships to U.S. by Priority Mail or First Class Mail. International shipping rates vary. Contact us with any questions.